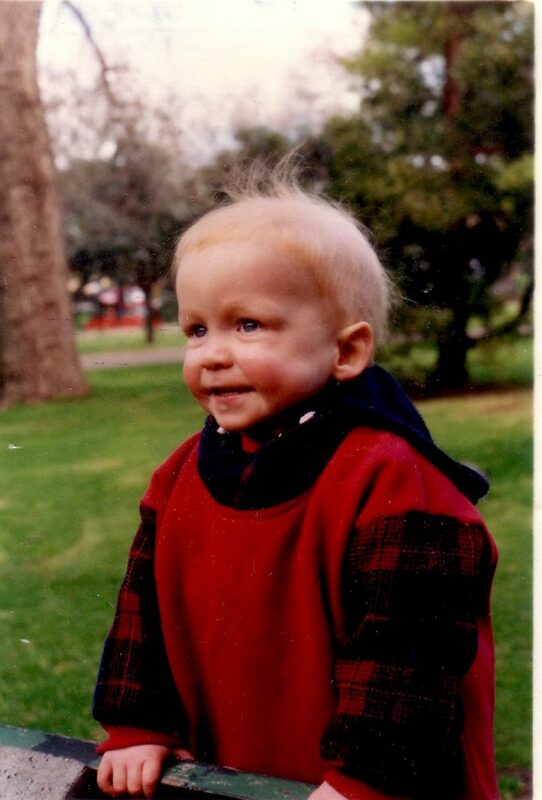 On the 21st June 1996 I noticed a large swelling on the right side of my son Brian; he was 2 years and 4 months old. The doctor confirmed that we were dealing with some sort of cancer and we were quickly admitted to hospital. Brian also had bronchiolitis at the time and was being treated for that which resulted in us not being on 6E (the cancer ward at The Royal Children’s Hospital) and feeling very isolated as a result. The next few weeks were a blur of tests and confusing speculation as to what we were dealing with. I was forty-one weeks pregnant and on Brian’s second day in hospital I went into labour. Forty-five minutes later Andrew was born in the Emergency Room of RCH; to this day people tell me how excited they were to witness his birth! At least they now stock cord clamps. It seemed to take forever to determine exactly what sort of cancer Brian had (in reality it was probably one week) and we started the chemotherapy before we were absolutely sure what we were dealing with. Finally they determined that it was neuroblastoma. I’ll never forget the doctor telling me that his chance of long term survival was 10%. The incidence of neuroblastoma is 1:100,000. If you filled the MCG with kids, mine would be the only one with this disease. I often re-read my journal and wonder how we got through that time. In reality we had no choice; Brian needed us, as did our newborn baby Andrew. The support of family and friends was tremendous. The standard treatment regime then called for a rotation of drugs between cyclophosphamide and cisplatin every ten days. Because the chemo was so aggressive he was very susceptible to infections and we were often admitted to hospital in the middle of the night. Because of this Andrew was weaned much earlier than I would have liked. Brian’s prescribed treatment plan went well for the first few months. Then he had a reaction to the cyclophosphamide. He was on oxygen in hospital and when he came home. This was exceptionally frustrating as the tumour had finally shrunk enough to be surgically removed but the side effects of the chemo meant that the surgery could not proceed. After many consultations with the oncologists and the heart doctors we were able to proceed with his surgery. Four months after diagnosis the turmour was removed and all tests indicated that he was in remission. We were relieved, exhausted and so happy. After two months the cancer came back and two months later we said goodbye for the final time. He had just turned three. I can’t begin to describe how awful that time was. There can be no worse experience for a parent than to see your child waste away in agonising pain. Brian was a gentle, loving, boy with an easy disposition and an engaging manner. He was a beautiful child with huge blue eyes and red hair. He loved trains and the Wiggles and was very protective of his baby brother. We miss him very much.